Not everyone has the space for a full-size fire pit, but this DIY tabletop fire bowl is the perfect solution. With just a few supplies and a few minutes, you can have the warmth and ambiance of a fire pit on your deck, patio or anywhere. Hanging out and entertaining on our deck in the summer is one of my favorite things to do. It’s relaxing, the fresh air feels wonderful and the food even tastes better. If you know me at all, you know that we love to have a fire going in our fireplace all winter long. I’ve been wanting to make a DIY tabletop fire bowl for the deck for a few years, and I finally decided this was THE year to make it happen. I mean, who doesn’t love sitting around a fire? right?! 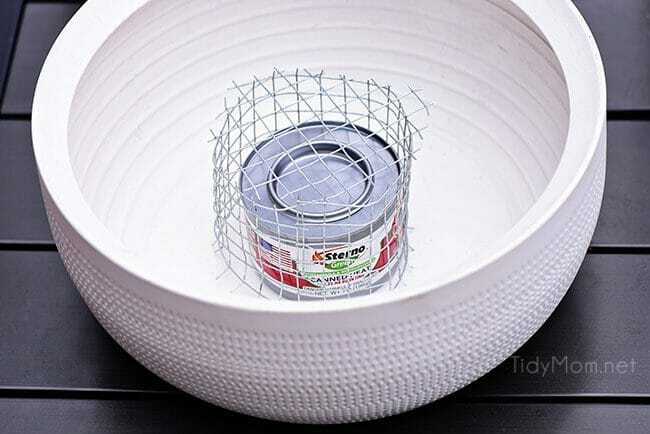 If you’re like me and want to watch a flickering flame without a lot of heat or the hassle of burning logs, then this easy tabletop fire pit bowl project is for you. I’m not sure why I waited so long to make it, because once I had my supplies, I put the fire bowl together in about 5 minutes! Today’s post is in partnership with my friends at Endust®. 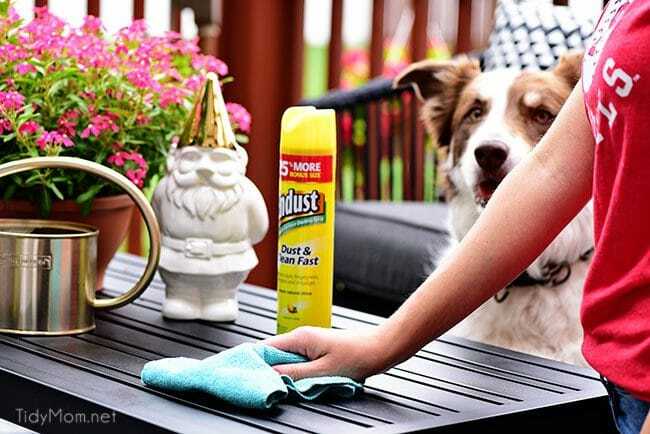 Designed to dust and clean multiple surfaces, Endust is the perfect cleaning tool for cleaning deck and patio furniture! Entertaining on a small deck doesn’t have to be complicated. All you need is good company, good food, a cozy atmosphere, and a clean outdoor space! 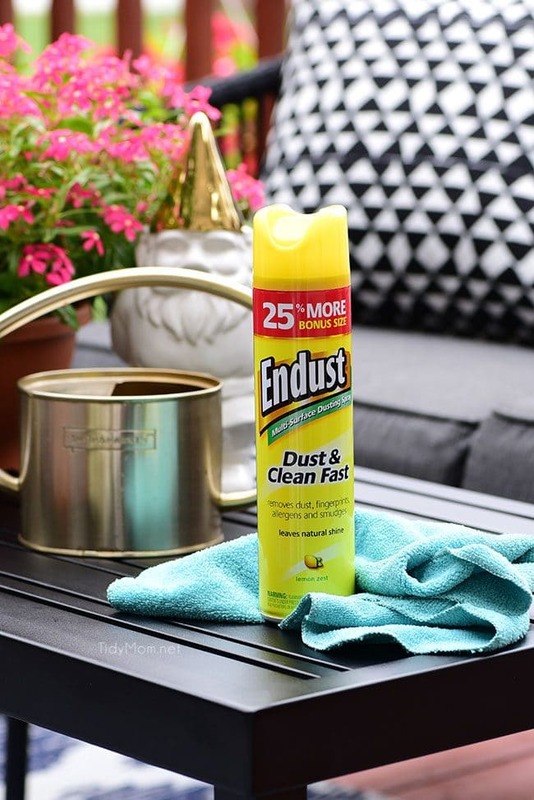 Did you know that Endust®, the Multi-Surface Dust Magnet is not a furniture polish – it’s actually a dusting and cleaning spray, made of a silicone-free formula. Endust turns your microfiber cloth into a magnet, locking dust, dirt, and allergens to the cloth so that you don’t push any dust into the air. Perfect indoors on furniture, cabinets, counters, paneling, window sills, non-fabric blinds, outdoors on patio furniture and even your car dashboard! It helps clean away oil-based stains like fingerprints, residue, and smudges. I simply use the dusting and cleaning spray on our outdoor tables, chairs and bar cart and I can feel confident that allergens and dirt will be away from our food and guests. 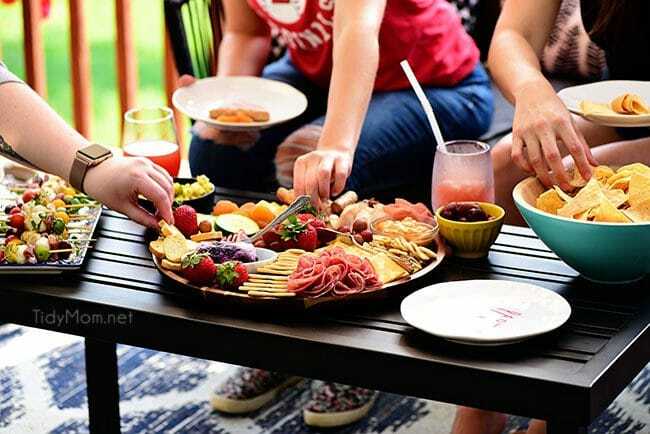 Serve antipasto skewers, a charcuterie board, pineapple mango salsa and watermelon wine slushies or a pitcher of Rosé Summer Sangria for a meal that requires ZERO cooking and very little prep–making it a perfect last minute meal! What’s an outdoor party without a fire?! 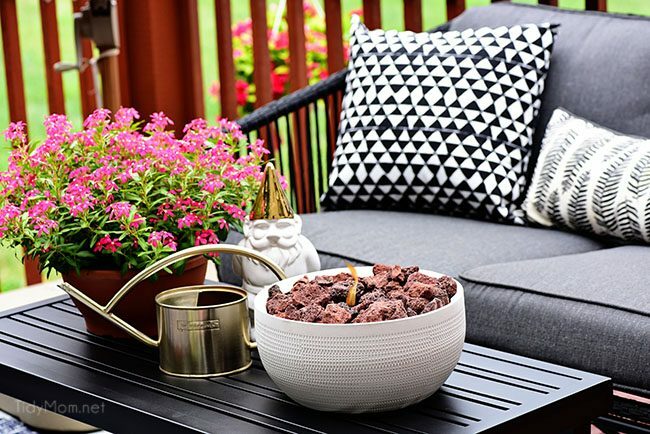 The warmth of a fire pit or fire bowl will instantly cozy up any outdoor space. 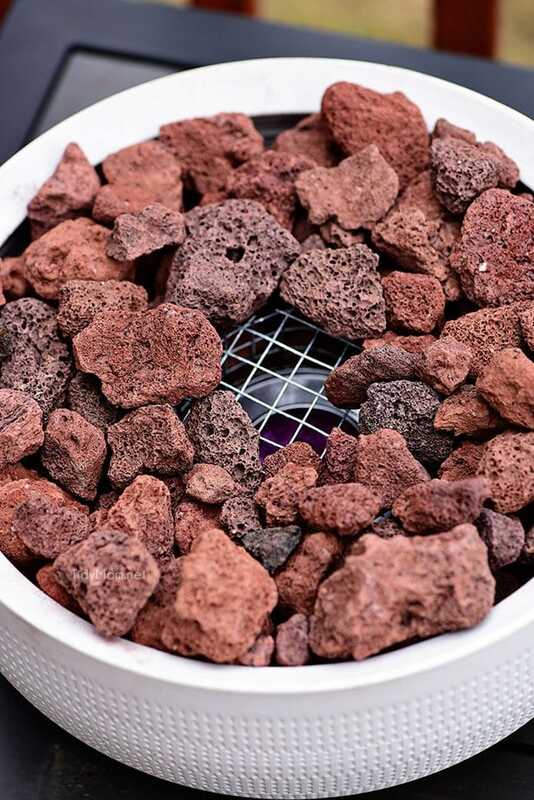 bag of lava rock (available at most home improvement stores or garden centers) or fire glass* (available at patio and fireplace stores, or online) –*do NOT use decorative glass rocks. It’s important to use fire-resistant rock or glass that is made to withstand high temperatures and won’t shatter when exposed to the heat. This first step is the hardest part of the whole project, but it’s really very easy. You will want to wear heavy work gloves so you can easily handle the hardware cloth. 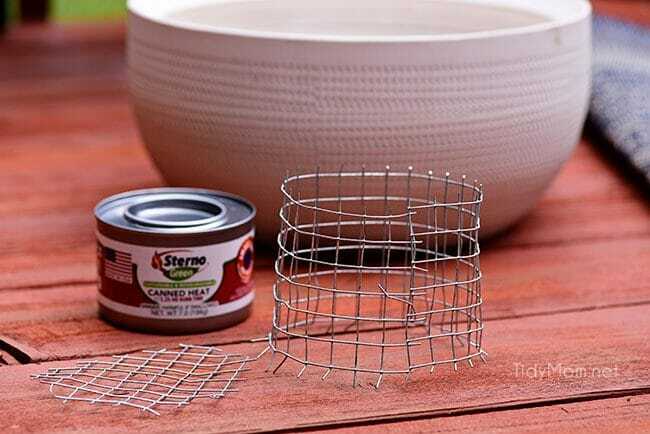 Using the tin snips and hardware cloth, create a “cage” with the wire that is just a bit larger than your can of fuel. This will allow you to easily replace the can. Then, pinch the ends together. Next, cut a wire circle to cover the top of your fuel can. This will prevent the rocks from falling into the can. 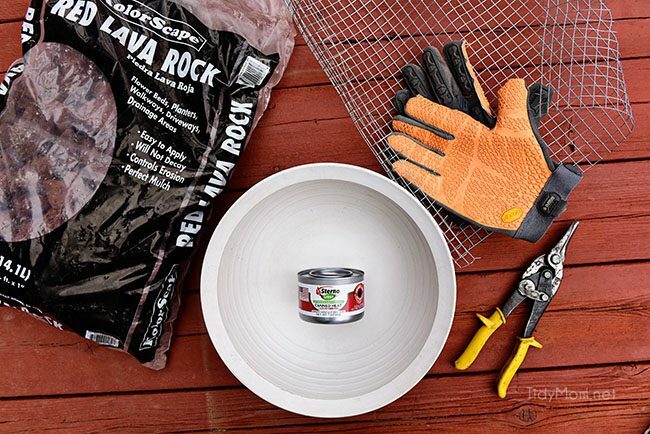 Place the fuel can and wire cage in the center of the bowl, and add lava rock (or fire glass) around the can. 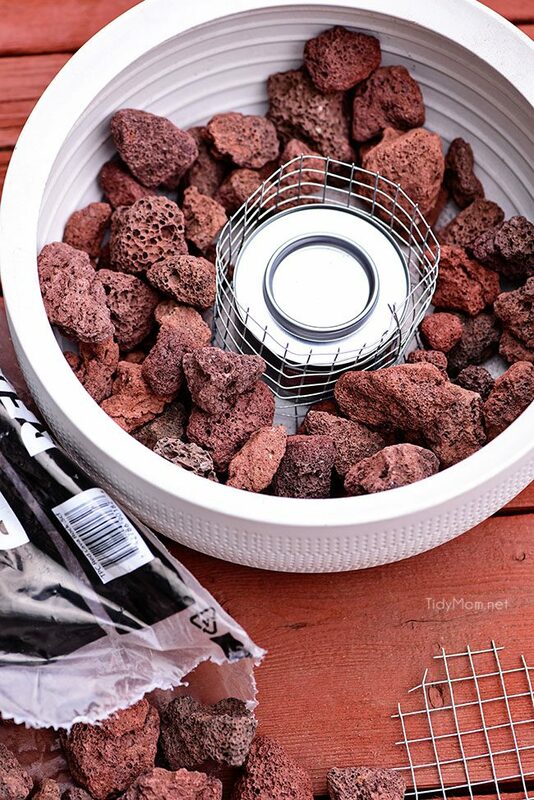 Open the fuel can and place the wire circle over the wire cage and continue adding more rocks until the bowl looks full. Leave space to light the fuel. If you want, you can push some of the rocks over the top wire once the fire bowl is lit. To replace the fuel can simply remove the wire top, remove the empty can and replace with a new can. Carefully light your fire bowl using a long lighter or match. Enjoy your tabletop fire pit bowl! Most of the gel fuel cans burn for about three hours. To put the flame out earlier, place something nonflammable over the bowl until the flame is snuffed out. Cans can be reused until the gel fuel is gone. Fire bowls can be used on the deck or patio any time of year. The fire is not only cozy, but it allows you to enjoy the outdoors long after the sun goes down. Note: if you want to roast marshmallows over your tabletop fire pit, be sure to get food safe fire in a can. Just remember, you may get marshmallow drippings on your rocks if you do this. 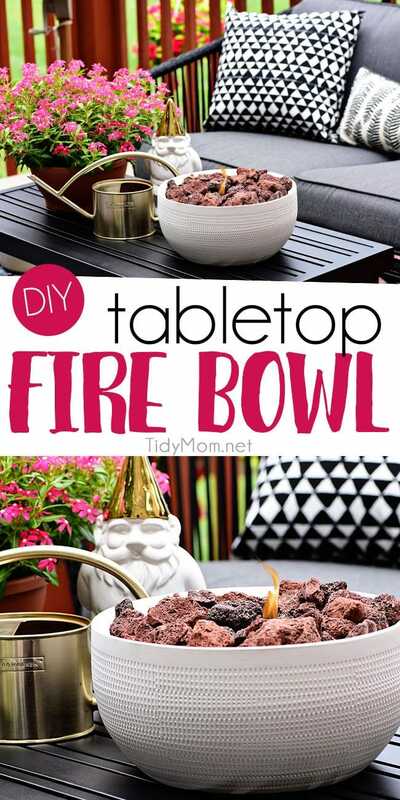 Grab some friends, drinks, and snacks and sit back to enjoy your DIY tabletop fire bowl. The ambiance, cozy warmth and glow of the flame are perfect for any gathering or just a quiet escape. Thanks to Endust, our deck furniture looks clean and beautiful! It leaves a natural shine without any residue or build-up. 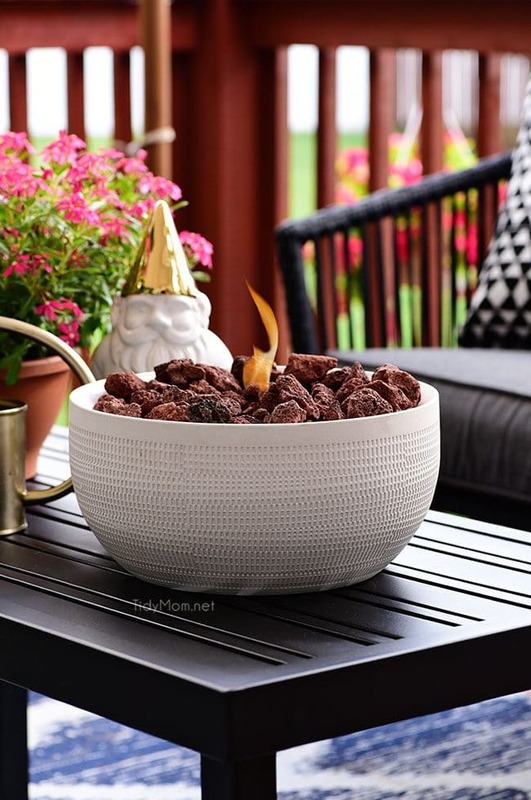 Like this DIY Tabletop Fire Bowl Project? Pin It! This post is in partnership with Endust. All views, opinions, and love of a clean home are my own. Thanks for supporting the brands that I love and make TidyMom possible. This is such a cute idea. You are such the entertaining queen! This is such a great idea! I am sure my husband will adore it! This is such a gorgeous idea!! A great addition to garden or patio! This is such a great idea! 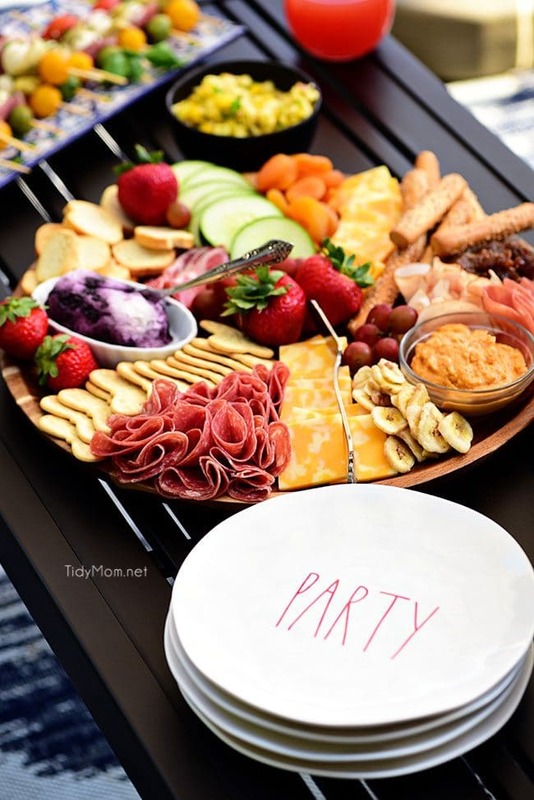 Looks like a fun party! Such an amazing entertaining space – I love it! What a fabulous idea! 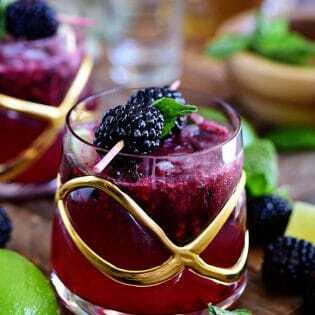 Must try it! I love that your pup is ready to help with the clean-up! Wish mine would get off their lazy cabooses! Love Endust and Pledge. They’re my go-to’s for cleaning everything from wood to stainless. hahaha!! he’s always ready to be in the middle of what’s going on! I love this gorgeous idea! I can’t wait to try it! what a great idea, love how many options this provides with the bowl and even the rocks, lava or otherwise, thank you!